The Bank of Ghana (BoG) has revoked the licences of five banks and subsequently merged them into a new bank — the Consolidated Bank Ghana Limited — to be headed by Mr Nii Amanor Dodoo of KPMG. 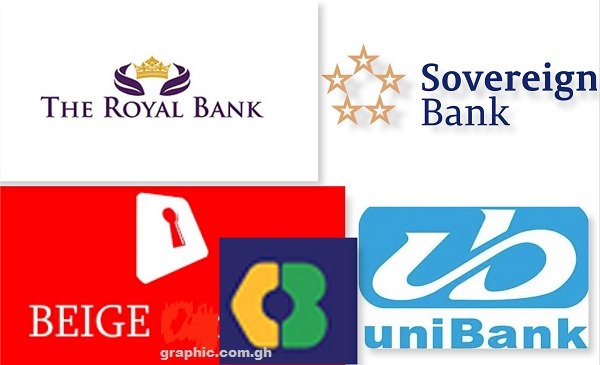 The entities — the uniBank, the Royal Bank, the Sovereign Bank, the Construction Bank and the BEIGE Bank — were found to have committed various regulatory and financial breaches that made them insolvent and unfit to continue operations. At a press conference in Accra yesterday, the Governor of the BoG, Dr Ernest Addison, said Consolidated Bank Ghana Limited was established by the government and issued a licence to operate on August 1, 2018. Consequently, the government had capitalised the new bank to the tune of GH¢450 million and issued a bond of up to GH¢5.76 billion as assets for it, he said. The bond is to make up for the gap created by the liabilities and good assets assumed by the Consolidated Bank. The collapse of the five banks into the Consolidated Bank is part of measures to holistically address the weaknesses in the banking sector which have a ripple effect on macroeconomic indicators. With this development, uniBank, which was put under rehabilitation in May this year, ceases to exist. The governor gave an assurance that “all deposits of the five banks are safe and have been transferred to the Consolidated Bank”. “The Consolidated Bank will assume the branches and staff of the five banks and operate its head office from the Manet Tower C, Airport City, Accra. “All customers will have immediate access to their funds through the existing branches and ATMs of the five banks. “Customers can carry out their business as usual at their respective banks, which will now become branches of the Consolidated Bank. “All staff of these banks will become staff of the Consolidated Bank. The boards of directors and shareholders of these banks no longer have any roles,” Dr Addison explained. He gave a litany of breaches, ranging from under-capitalisation, use of suspicious and non-extent capital to obtain licences by false pretences, high non-performing loans (NPLs), illegal disbursement of loans to shareholders and connected parties to non-disclosure of their true financial status to the BoG. In the case of uniBank, which has been under administration since March this year, he said the official administrator had found that it “was beyond rehabilitation”. “uniBank had given out amounts totalling GH¢1.6 billion to shareholders and related parties in the form of loans and advances without due process and in breach of relevant provisions of the Banks and Specialised-Deposits Taking Institutions Act (2016), Act 930. “In addition, these shareholders and related parties had also been given amounts totalling GH¢3.7 billion, which were neither granted through the normal credit delivery process nor reported as part of the bank’s loan portfolio. “They were also not secured with collateral and attracted no interest income for uniBank. Altogether, shareholders and related parties of uniBank had taken out GH¢5.3 billion, constituting 75 per cent of total assets of the bank,” he said. Dr Addison added that out of the total customer deposit of GH¢4.3 billion, GH¢2.3 billion was not disclosed to the BoG. Loans and advances to customers were also overstated by GH¢1.3 billion. With regard to NPLs, he said more than 89 per cent of uniBank’s loans and advances book of GH¢3.74 billion as of May 31, 2018 was classified as non-performing. That was in addition to amounts totaling GH¢3.7 billion given out to shareholders and related parties which were not reported as part of the bank’s loan portfolio, he added. The story of The Royal Bank was not different. It was found to have been insolvent and faced with acute liquidity challenges. The governor explained that the bank suffered severe capital impairment due to under-provisioning for loans, over-estimation of investments with other financial institutions and over-statement of capital on account of fixed assets, which were rejected by the BoG for capital purposes. “This resulted in an adjusted capital of negative GH¢484 million,” Dr Addison said. He added that a number of the bank’s transactions, totaling GH¢161.92 million, were entered with shareholders and related parties structured to circumvent single obligor limits under Act 930, conceal related party exposure limits under Act 930 and to over-state the capital position of the bank for the purpose of complying with the capital adequacy requirement (CAR). On the BEIGE Bank, the governor said the funds purportedly used by the bank’s parent company to recapitalise were sourced from the bank through an affiliate company and in violation of regulatory requirements for bank capital. He said the bank also persistently breached the cash reserve requirement (CRR) of 10 per cent, with its CRR as of July 23, 2018 being at 1.97 per cent. In the case of the Sovereign Bank, Dr Addison said the BoG found that there was no reasonable prospect of a return to viability, after extended periods of regulatory breaches, exposure to central bank liquidity support and inability to publish audited accounts. In respect of the Construction Bank, the governor explained that the BoG found that initial minimum paid-up capital of the Construction Bank of GH¢34 million was funded by loans obtained from the National Investment Bank (NIB), contrary to central bank regulations. To read the full piece from Graphic Online, click here.